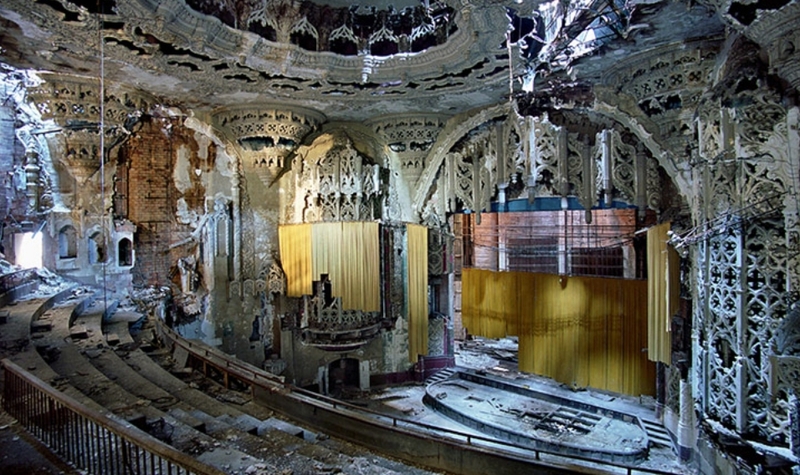 Here is a sad and poignant photo essay of the death of Detroit. 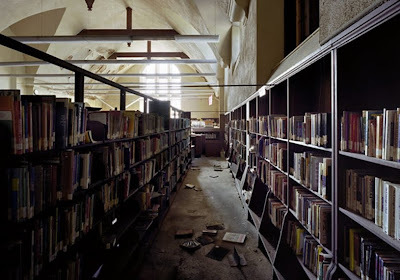 Here's an abandoned library. This photo startled me. 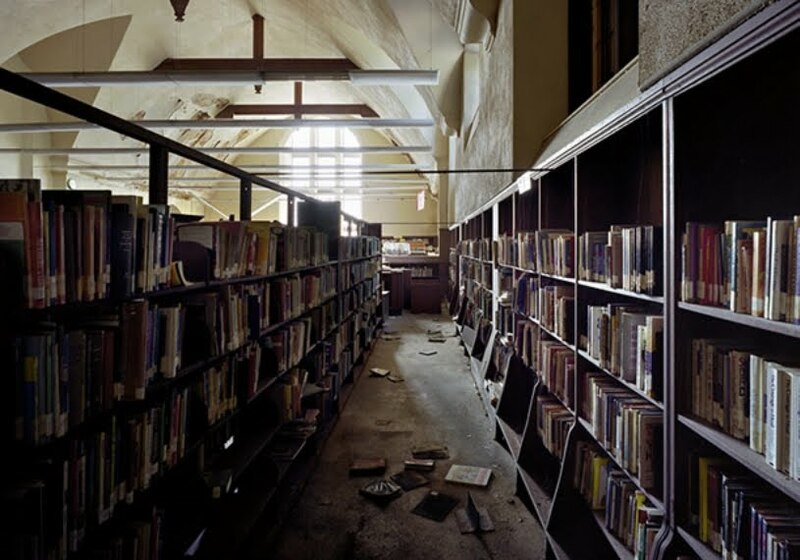 Books, abandoned? How can a whole library-full of books simply be abandoned? Doesn't anyone want them? reasons for this type of decay, nothing will change. The entire country could resemble Detroit considering how many people feel they are entitled to everything under the sun. "Pride goes before a fall." But lack of pride creates a mess. I can't get over how so much was just left behind. The library shelves still full of books are just killing me. I thought Detroit was experiencing something of a revival. Presumably some of the buildings shown have simply become redundant due to cultural changes. We need to build factories here in the U.S. and get people back to work. Detroit was a beautiful city at one time. I know this sounds weird but as I looked at the photos my chest ached. I felt physical pain as I looked at them. The structure of the building are so beautiful and yes, as Birdy said, it is hard to see that things were left behind as if the Rapture had happened or something. How did this happen? Did the people leave for work one day and was not able to return? The scenes remind me of the movie Book of Eli. 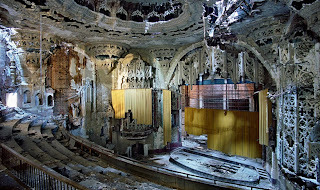 It is depressing to see such beauty go to waste, and to think of how this affects the residents of Detroit. Oh my, may God have mercy on America. I'm sorry, but beauty and big cities just do not go together in my mind. When I think of beauty it is a mountain peak, a meadow filled with flowers, a rocky waterfall, a cool mossy floor in a forest. It is recognizing that our Creator did not need any assistance from man to beautify our world, but He allows us to participate, however, miniscule our efforts actually are. Just my 2 cents worth. Haven't these people heard of ebay or craigslist? Those chandeliers, books, GRAND piano and other items would be snapped up in a heartbeat. There are salvage companies that would take the beautiful ornate woodwork and other items and turn it into something else of beauty. We are such a throw-away society! I agree, it does look like something out of Book of Eli. The result of decades of socialist politics. As for building new factories, people need to figure our how Americans can make a product cheaper and of greater value than someone in China who is willing to work for 1$ per hour. Just because you feel your are entitled to high wages does not mean you have the right to them. The US needs to innovate and develop something the world wants at a price they are willing to pay. If you expect the world must pay a lot of money for what you create then you are no better than the socialists that destroyed Detroit. They certainly haven't heard of designed degradation. As the waste impacts the whirler, steps are taken to minimize the damage. Selling the books would have been one of those steps. The underlying cause may be that gov workers don't know the value of things, of money. This IS the town where people lined up to get "Obama Money". all I can say is, let me in that library! What a crying shame. Thank you for posting this, Patrice. I found it last night while reading at WorldNetDaily, and the first thing that came to mind was our space program. Like the U.S. auto industry, our NASA space program has developed technologies and materials that have saved and improved lives across the globe in innumerable ways. But it appears American today is almost totally oblivious to this fact. Detroit has fallen, and the last figures I saw showed muslims make up at least one third of its remaining population, which I believe is the highest percentage in the country. What if any is the nexus? As the dark age descends on this once fine city I'm left with a deep sadness and embarrassment that this is happening in America. Detroit has been ruled by democrats since most of your parents were wearing diapers. Hmmm does that tell you anything? It is weird seeing such decay in our cities, but it has been happening in the United States for decades. I remember traveling into D.C. back in the 1980's with my In-laws. I think we drove in through the North side, or Northwest side and it made me think of a bombed out Beirut. That was our capitol. And Anonymous above is correct democrats have ruled not only Detroit but many of our major cities for decades and the result is clear. That said, empires come and go and should the Lord tarry, in 500 years people will be excavating our cities and visiting the ruins, like we visit the ruins of the Roman or Aztec empires. Nothing last forever. The end result of unions and the Progressive's desire for a Utopian city. Sadly, the mayor is going to be turning 20% of this city back over to gangs and homeless, as the city cannot afford to take care of basic services. For the library w/ abandoned books, take a look at Detroit Public School statistics. Most of the students probably cannot read those books. The Eastern Market was once a wonderful place to shop, not anymore. To the commenter on Muslim population, the majority of Muslim population resides in Dearborn, a suburb outside of inner city Detroit, all the same, Dearborn is looking really bad now too. These pictures should be front and center on every warning against socialist poilicies. "Detroit Is Halting Garbage Pickup, Police Patrols In 20% Of City: Expect Bankruptcy In 2011." "A mere 25% of students graduate from high school." Anyone interested should read the whole article. There's a lot more and none of it is good. The 11th largest city in the US is in a death spiral. Sobering set of pictures that will reflect the end result of the path taken by our once great nation. If anyone thinks political solutions will solve these problems generated by these same polticians who created this mess than you think denial is a river in Egypt. The "revival" in Detroit was very short lived. Killed off by high taxes and union/political corruption. Mayor Bing has recently tossed out the idea of incentivising people who will move to better neighborhoods. Yeah, that will work, let's just spread the cancerous entitlement attitudes all over East MI. Combine all the destructive policies that socialist/marxist like to institute and top that with the likes of Monica Conyers (bribery) and Kwamee Kilpatrick (former mayor- abuse of funds, power); and the extensive list of corrupt pols who came before...Detroit never really had a chance. Just for giggles, when you look at the article on percentages of Detroit graduates, google the forme president of Detroit School Board, Otis Mathis. There were several articles on this man. How he ever was considered qualified to lead a school system is a complete mystery. OOOOO, a library abandoned is just beyond my comprehension. And makes my heart hurt. I agree, the abandoned library is the most shocking aspect. It shows it's a city that lost it's heart and brain, not just the trade aspect. There was a theme in all of this that just jumped off the page and left me gobsmacked. I saw the icons of Faith, Culture and Literacy abandoned and left to decay. As these go, can the rest be far behind. The essay should serve as an ironic memorial to American socialism. This looks like a scene out of an apocalyptic movie - a scenario we all alternately dread and wish for, depending on the news of the day - ahem. But there is also a staged look to them, giving me a kind of "Snopes" moment, so I did some research. Unfortunately they are quite real. 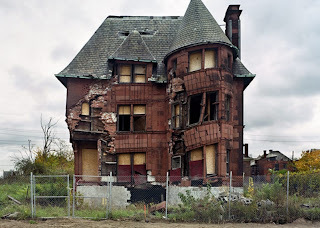 Below is a link to the website of the two photographers who documented these buildings in and around Detroit, starting in 2005. There is a whole collection of pictures. I'm sure each has a story and the explanations would probably help some of these make some kind of sense, but in general they just leave you feeling a little depressed by the unimaginable waste and neglect, and wondering if you are looking at some prophetic vision of America as a whole. What happened to Detroit ? the same thing that is happening all over the world. Where ever blacks move in and take over, this is what happened. Sad , sad. They are never happy no matter how many programs they get or how many free meals they get. My poor children will have to work themselves to death because of them . having to keep them up thanks to Democrat government.